Graces' Adventures Down Under: Oma Comes to Town! 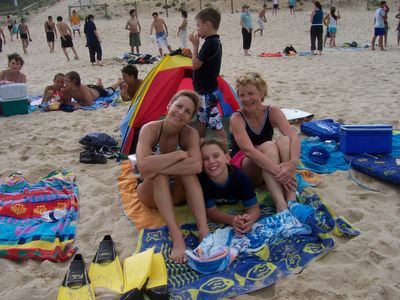 We spent a nice day at Cronulla Beach with Birgit and her friend Carol (oops I missed her). At one point we were ordered out of the water and the siren was sounded. Carol enquired and sure enough hammer-head sharks were spotted in the water - after a lifeguard boat scared them away everyone ran back into the water.